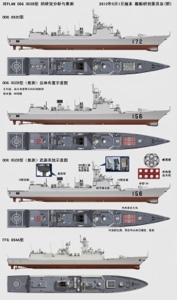 The Chinese Navy ( sometimes still called the PLAN/People’s Liberation Army Navy/) appears to have finished it’s experimentation~development with their premier surface combatant, the medium DDG 052C/D producing a rough equivalent of the western Aegis (at least in their boosters eyes.) the ship very obviously follows western design concepts but appears to be a very competent design, at least from “it’s likely right if it ‘looks’ Good metric,” though the radar and computer part of the system are probably not that good, yet. This good article in the Diplomat discusses this and its implications in some detail. This entry was posted in Future, MilTech and tagged China, DDG, Future, south China Sea by Sci Fi Engineer. Bookmark the permalink.